Spy or Die Trying is a game designed by Richard Wolfrik Galland, published by Warm Acre Games. It is for 2-4 players. In this game, one player will be playing the boss of S.W.O.R.D. the Secret World Order as he defends his secret base from the peacekeepers of P.E.N. the Peace Enforcing Nations. The P.E.N. 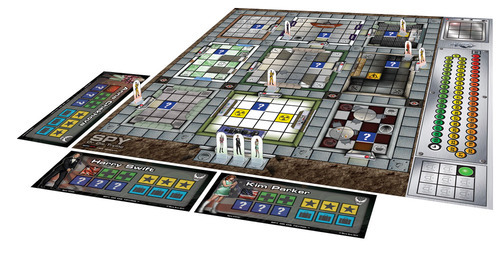 agents will only have 1 hour working together to infiltrate the base and save the world. In the meantime, the S.W.O.R.D. player will be doing their best to defend their base and keep the agents from winning. The player(s) that are best able to accomplish their mission will be declared the winner(s). To begin, one player is the S.W.O.R.D. player and will take control of the boss and minions of the base. The other player(s) will choose one of the 3 P.E.N. agents. They will receive a character profile for their chosen character. They will then take a stealth marker and place it hidden side up on their profile. They will choose a talent marker and place it on their profile as well. They also place a handgun marker and choose an item marker to place on their profile. They take the corresponding character’s figure and place it one of the agent squares on the outside of the base. The defender places a door marker with the red side face up on on every door including the extra large base door on the board. The boss figure is placed on one of the spawn squares in the sanctum. A guard figure is placed on the yellow security square in the control room. Either a scientist is placed on one of the infirmary spawn squares or a technician is placed on the generator spawn square. This is chosen by the player. 1 guard is placed outside a room’s doorway for each P.E.N. agent playing. 4 camera markers are placed on different junction squares along the hallways. A secret passage marker is placed on an empty square in a room other than the sanctum. The intelligence markers are shuffled and placed randomly face down on each of the intelligence squares. The doomsday weapon markers are placed face down beside the board. The alert marker is placed on green side up. The time marker is placed on the 60 minute mission timer track. The P.E.N. players then choose who goes first and the game can now begin. The game is played in turns, starting with the Intruders. On a player’s turn they may perform 2 actions. They can move, pick up, sneak, breach, search, explore, sabotage, reveal, hide, sneak attack, fight, shoot, rest, and heal. I’m not going to go into a lot of detail here, just understand that there are a lot of choices to be made and most of them will cost time. Time is an very important commodity that you don’t want to lose a lot of. Some actions are automatic while others will require a dice roll. To succeed at a dice roll the intruder must roll a 4, 5, or 6 on a 6 sided die. Some actions will allow the player to “take time”. What this means is that the dice are rolled. For every success, a minute is taken from the action’s base time. That number is then taken from the mission timer track. Once the intruder’s have taken their turn, it’s the defender’s turn. The defender’s turn consists of 3 phases; spawn, actions and time. While the intruder’s only control their character, the defender controls the boss, guards, technicians and scientists in the base. In the 1st phase, the defender uses alarm markers to bring in new minions depending on the alert level of the base. This is of course determined by the alarm markers so taking them off will keep the alarm from being raised but will also make more opportunities for the alarm to be sounded thus making more alarm tokens. I hope you were able to follow that line of thought. Each minion will then be placed on a spawn square in the proper room. Guards spawn in the guardroom, technicians in the generator, scientists in the infirmary and the boss in the sanctum. If the boss is in the cafeteria, any type of minion can spawn there. The next phase is the actions phase. This phase is very similar to the intruder’s turn except that each minion takes 2 actions each, so it takes a little bit longer. If the action that the minion takes requires a dice roll, they will only succeed if they roll a 6. Minions take their actions starting with the boss then proceeding in order with guards, technicians and then scientists. The actions that they can take are move, spot, discover, fight, shoot, construct, repair, lock/unlock, arm/disarm, research and recover. Again, I won’t go into a lot of detail here, just know that these actions will not take time off the mission timer. The last phase is the time phase. This is done at the end of the defender’s turn and it reduces the mission timer by 1 minute. If at any time the mission time reaches 00, the game is over and the intruders have lost. So how do the intruders win? Remember those intelligence markers I mentioned in the setup? The intruders will be trying to pick those up. There are 3 different colors, red, yellow and blue and there are 3 different countries, USA, England and Russia. Each intruder can carry a maximum of 3 of them. They will try to escape the base with enough markers in the right combinations to score points. Once the intruders have escaped the base, the game is over. The intruders will then pool together all their picked up tokens and will try to combine them in a scoring combination, then depending on the number of intruder players, they will check the point totals to see if they tie, win or have an epic victory. The player(s) that complete their objective will win. There’s really a lot of game in this box. There are lots of cardboard tokens for lots of different things from cameras and traps to talents and wounds. They are all thick and sturdy with lots of great artwork on them. The board looks like the inner sanctum of a James Bond villain with lots of rooms. The intruder profiles are a little thin but the artwork is outstanding on them. The figures that come with the game are all cardboard as well and they look nice. I’ve seen that there are actual miniatures for the game that can be bought separately. Unfortunately the base game doesn’t come with them. That would have been really awesome if they did. In any case, I’m really blown away with all the cool stuff that comes inside the box. It’s really cool. The rulebook for this game is huge. At a whopping 24 pages, there’s a lot of stuff to be covered. At least now you understand why there’s no real way that I could have explained every action in detail. We would have been here forever. Don’t let the size of the rulebook frighten you though, everything is really easy to read through and understand. It’s just gonna take some time to get done with. There are lots and lots of pictures, examples, and art throughout the pages. Everything is really made clear, but you will be coming back to figure out how to do something or what you can do several times throughout the game. There’s a really nice icon chart on the back cover that explains what each icon and token does. That’s a great help. Of course, you’ll still be flipping back through the pages to see certain things. I feel like after several times of playing though, you will start to understand what there is to do and how to do it. I really like the artwork throughout the book as well as the really great example of gameplay at the end. That kind of helps you see some of the mechanics of the game in action. As you can see, there are a lot of choices and decisions to be made on each player’s turn. Each room has special things about it to make it a little different than the others. Characters have special abilities. Intruders have abilities that can be customized at the beginning of the game, so no 2 games have to be exactly the same. There’s really a lot to do in this game and every bit of it is absolutely great. As I said earlier, you’ll be checking the rules every so often to see what to do or how to do it, but it’s still loads of fun. I for one love the fact that you can do so many different things. It’s like a James Bond video game in board game form. It is so much fun. I really like being the defender, commanding my minions around the base to do my bidding. It’s really cool and makes you feel like a Bond villain. On the other hand, the intruders have that Bond feel as well as they sneak around the base trying to get the intelligence to undermine your evil plans. Either way you play, it’s tons of fun and really enjoyable. Spy or Die Trying is a medium weight game of James Bond proportions. Fans of the James Bond movies will love this game as it literally drops you right into the middle of one, at least that’s how it feels. The game takes a little over an hour to play. It has tons of different things to do and is a lot of fun. The artwork is really cool, however I think I’d suggest picking up the miniatures as well. They would just make the game a lot cooler. To me, it’s got to be the best spy game out there. Don’t feel overwhelmed or turned away by the size of the rulebook. You will understand the game. Trust me, it’s worth it. I really like everything about this game. I just want to know why there aren’t any sharks with frickin’ laser beams on their head? HUH? What’s up with that? In closing let me say that I highly recommend this game. This is definitely one to pick up if you have any kind of love for the spy genre. I do and I love the game. 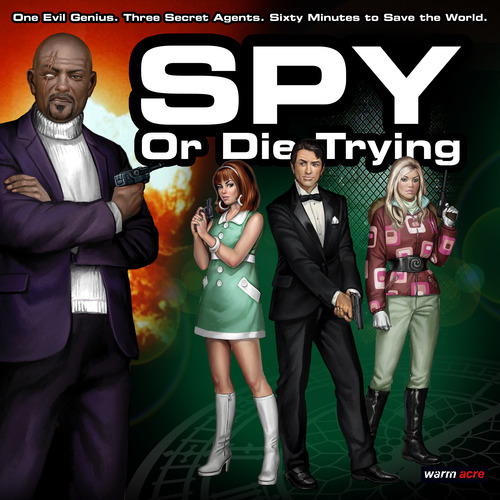 For more information about Spy or Die Trying as well as several other great games, please check out Warm Acre Games at their site. This entry was posted in Reviews and tagged acres, board, board games, card, card games, die, galland, games, pen, richard, richard wolfrik galland, spy, spy or die trying, sword, trying, warm, warm acres, warm acres games, wolfrik. Bookmark the permalink.